What Flooring Should I Choose For My Business? When it comes to new floors for your business, there are quite a few options to choose from. Many companies use carpet, tile, or vinyl, but it ultimately depends on the style of your office and your needs. 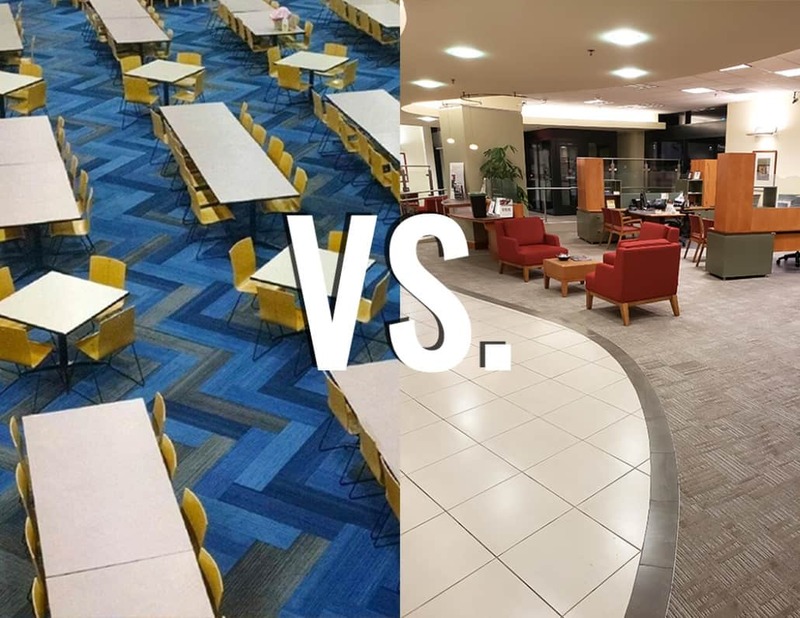 The first step to choosing new flooring for your commercial space is to consider the company’s lifestyle and what the floor is holding up against. Different types of installations and different colors portray different atmosphere tones, as well as vary in durability and pricing. After you have a better idea of the direction you want to head, consider your flooring options. Some of our most popular installations are with carpet, tiles, vinyl composition tiles (VCT), and vinyl. Carpet is great for insulation, energy efficiency, lower noise levels, as well as added comfort and coziness. It’s a popular choice for low to medium traffic areas like office spaces and is available in wide range of styles, colors, and construction, making it the most flexible and customizable option for flooring. Installing carpet tiles make it easier to replace specific areas that are damaged or stained. However, it does need to be cleaned often to prevent allergen build up. Tile is best known for its durability and stain resistance, making it a popular option in high traffic areas like retail. With a wide variety of styles and colors, tiles can make spaces seem more elegant and luxurious. However, that comes with a larger price tag. Additionally, it’s not the most comfortable for employees or customers to stand on for a long period of time, and is expensive to repair. Vinyl/VCT is also offered in a variety of styles, colors and designs. This is a popular option for big offices, healthcare, and retail spaces. It’s ideal for high traffic areas like these because it’s durable and can resist scratches and stains. It’s usually the cheapest option and is low-maintenance. The downside of vinyl is that it’s hard to replace if only a specific area needs it. At JKP Flooring, we specialize in flooring for occupied office space throughout California, Arizona, and Nevada. Since 1989, we’ve installed all types of floors for companies like Intel, Sony, and Google. Whatever your installation might look like, we’re here for you and would love to give you a free estimate. Give us a call today at (800) 500-5739.
https://www.jkpflooring.com/wp-content/uploads/2018/08/jkpwhichfloor.jpg 816 1056 idgadvertising https://www.jkpflooring.com/wp-content/uploads/2018/01/jkpLogo.png idgadvertising2018-08-13 11:30:472018-08-13 11:30:47What Flooring Should I Choose For My Business? Why JKP Flooring is Perfect for Your Business How Often Should Your Commercial Carpet Be Replaced?